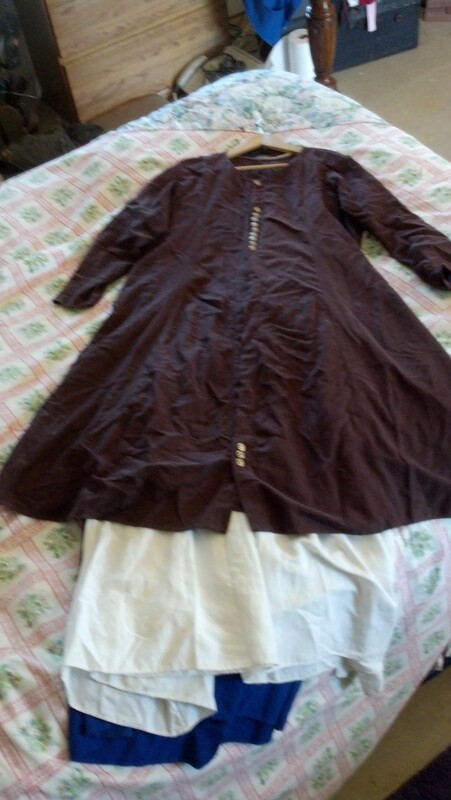 One of the challenges that we deal with all the time is how to safely transport long gowns and tunics to events. I remembered that when my children used to compete in major figure skating competitions a lot of the skaters had custom garment bags. A single outfit, and all of the accessories that went with it, would go into a specially designed bag. That seemed like an excellent solution, so I went to the internet to see if I could locate some general directions for garment bag construction. I wanted one without zippers that would take into consideration the sheer volume of the fabric that I was trying to transport. And there it was – a web page with instructions on how to build a custom garment bag that is designed to handle bulky or long items. 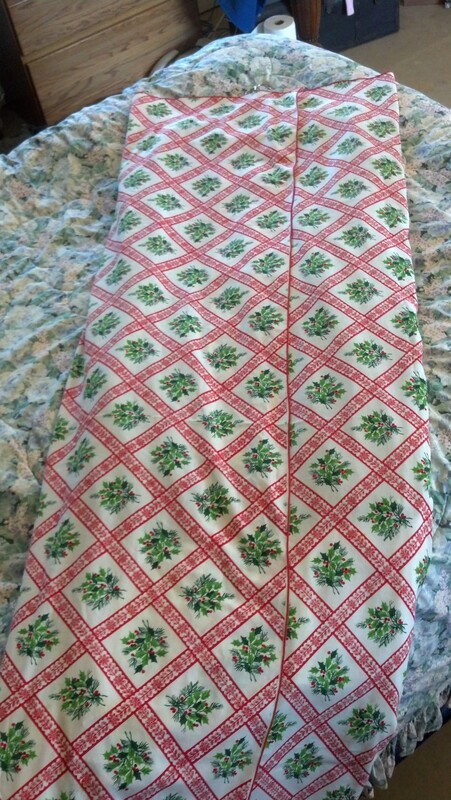 Now I understood how someone else was making a successful garment bag, and I actually have bought some good quality ticking to make some custom bags, but I was looking at another issue at the same time – what to do with an old, completely intact, but stained on one end, Christmas table cloth. The stain simply would NOT come out. But it felt like a waste to just toss it out. And then the two projects merged in my brain and here it is. 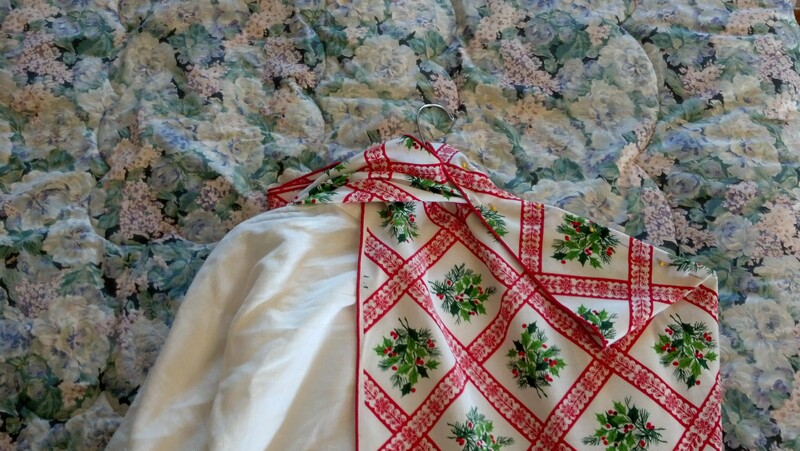 I laid the table cloth out on my bed – it was the only cat and dog free location that was big enough. 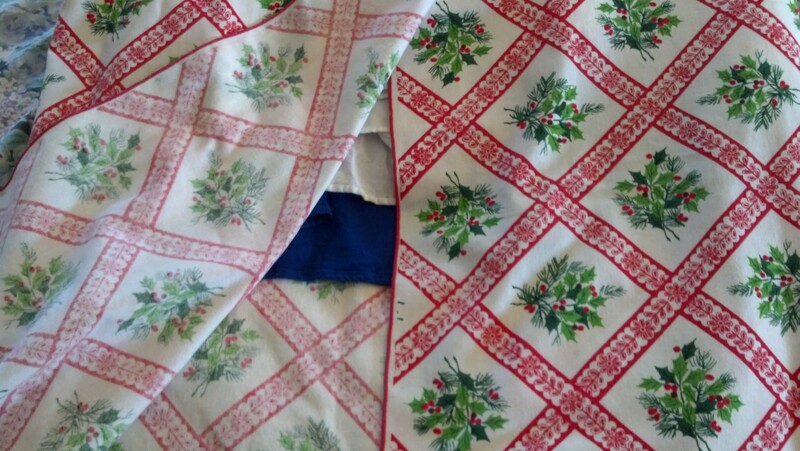 I recommend using large rectangular table cloths – thrift store finds are perfect, and cheap. Center the hangers that you plan to use, with the clothing that you plan to hang on them on the short side of the table cloth so that the longest part of the table cloth will be way longer than the clothes that you want to protect. 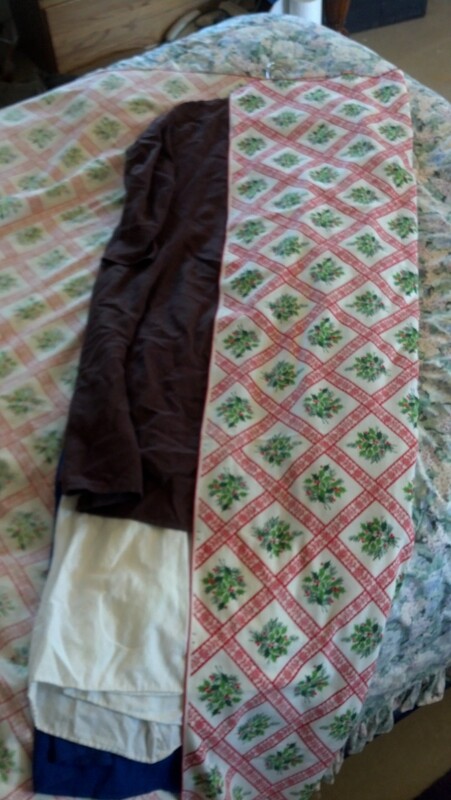 Then carefully fold over one side of the table cloth so that it goes more than half way across the clothes. Do not make it tight against the clothes – leave at least three inches at the shoulder. Make sure that you keep the top edges of the table cloth even and straight. Use a couple of sewing pins if you need to to keep things from sliding. 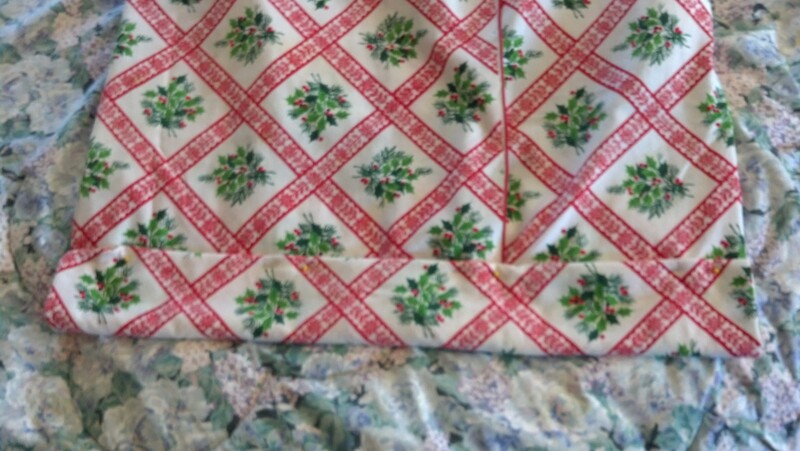 Then fold over the other half of the table cloth, lining up the top edges again and pinning them to keep them from slipping. You now have a big cloth burrito with clothes hangers sticking out of the top. So now it is time to shape the top. 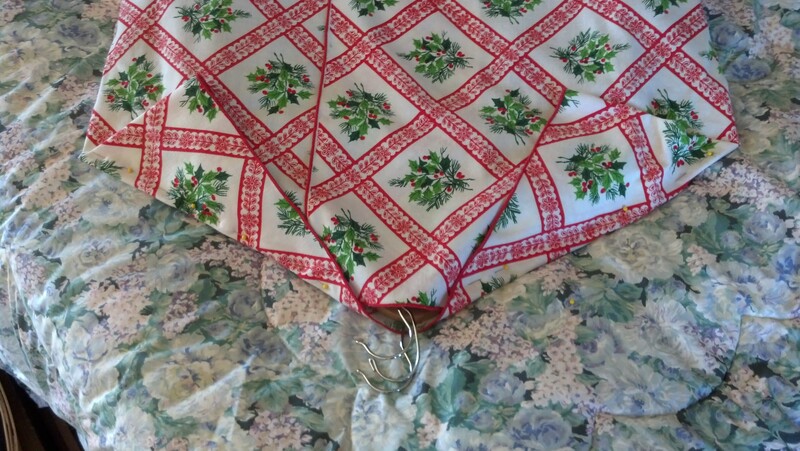 Carefully fold down the top corners of the table cloth to shape the bag and pin it. Be sure to catch all of the layers of the table cloth in the pins and NONE of the clothing. You can choose to place the folds to the front or the back, hide them inside, trim them off – it is up to you. You will need to sew the shoulder seams. I recommend leaving about 2-3 inches open for the hanger hooks. Once you have the top pinned, or sewed, go to the bottom of the soon-to-be-bag and figure out how long it needs to be. The easiest way to do this is peek inside. I recommend leaving at least an extra 4-6 inches at the bottom before you seam it. I usually leave a little bit more so that I can throw a pair of shoes and socks in the bottom of the bag. Once you have decided the length of the “bag” you can cut it, sew it, fold it, whatever you want. I decided to fold mine and then whip stitch it in place. I view the bag as a work in progress and I wanted the option to able to change things later. To take clothes in and out of the bag, just open the flap. If you are concerned about the flap opening you can add a tie or two to keep it closed. 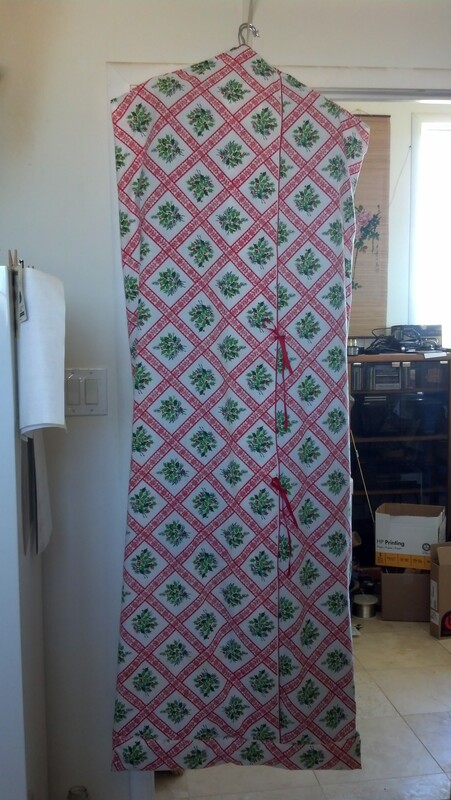 Here is my final version, hanging in the laundry room. This entry was posted in SCA Life by Eirny. Bookmark the permalink.